La Bloga: Free Poetry. Print Reports. On-line Floricanto. The land rises steeply up Los Angeles' Bunker Hill, a green space flanked by massive cement government buildings. The terrain makes it a walk of multiple stairs and gently sloping ramps to land on wide paved terraces and sprawling lawns. 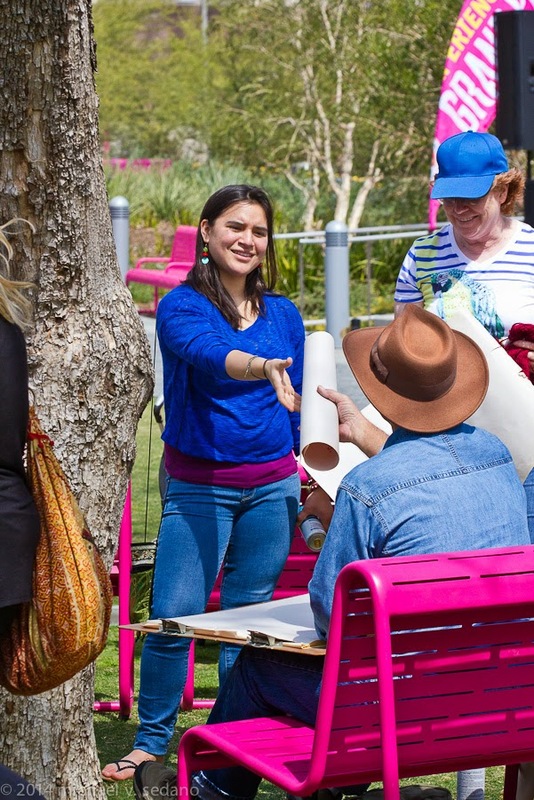 Landscaping, and the gente at today’s Grand Park Downtown Bookfest, keep my attention on the ground, then I look up. All I could see from where I stood was the Music Center at the top of the hill. I turned and looked the other way and saw City Hall tower. 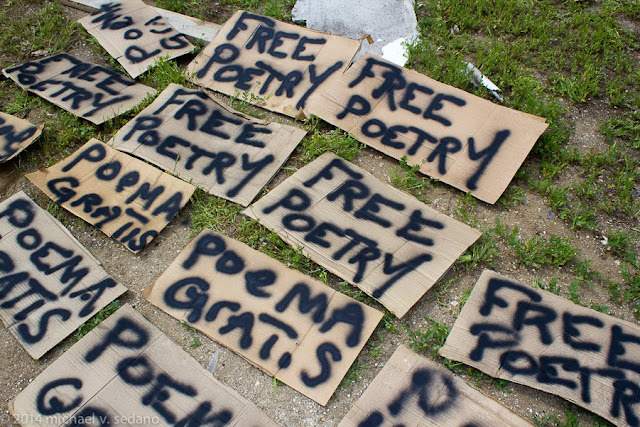 Then I go in search of free poetry. 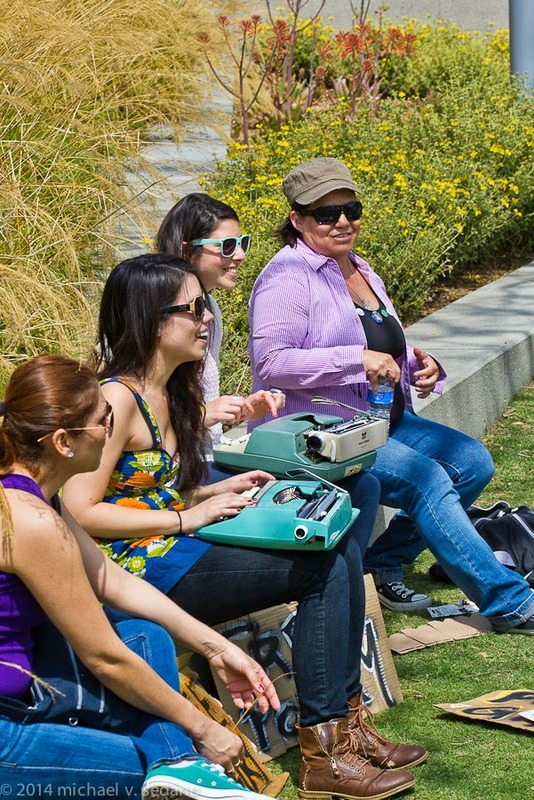 Grand Park Downtown Bookfest signals Los Angeles’ ongoing support for literacy—there are never too many bookfests--and the region’s renascence of poetry as a public activity. 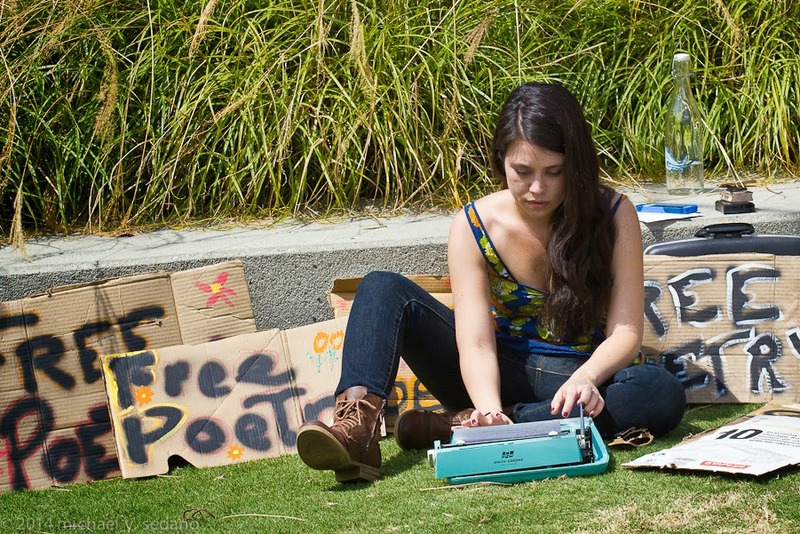 Today, poets will both read and compose on-the-spot poems; for free, just stop and chat. 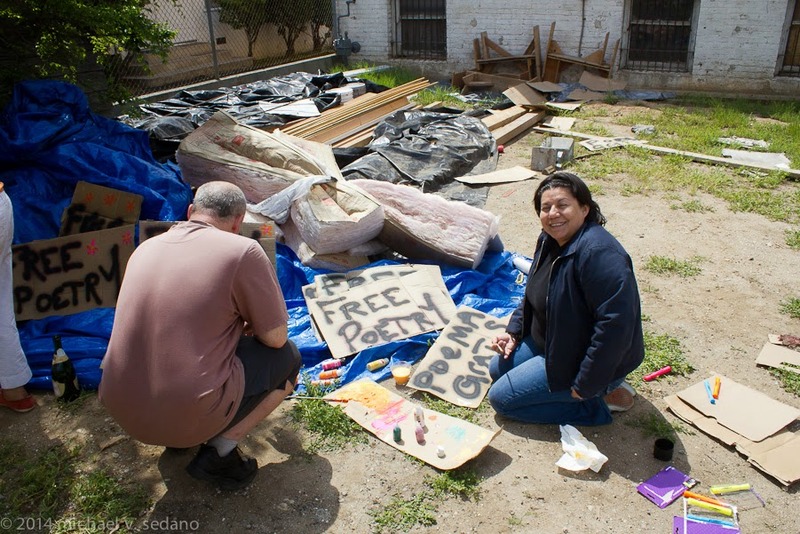 Saturday’s quest begins Thursday afternoon in Highland Park, at Avenue 50 Studio where Jessica Ceballos, Los Angeles’ indefatigable poetry promoter via Poesía Para La Gente, assembles a sign-making crew. 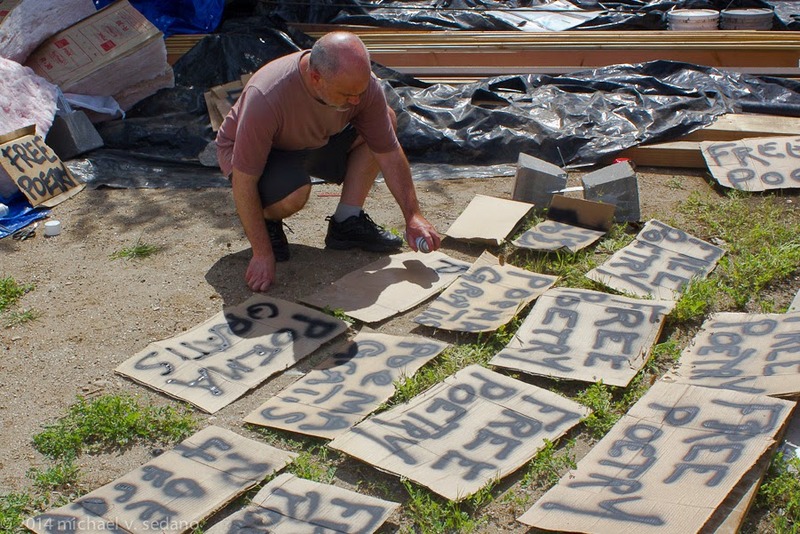 Starting with the rawest materials, Scott Doyle, Naomi Molinar and Lucy Delgado craft “Free Poetry” and “Poema Gratis” signage for Saturday’s event. 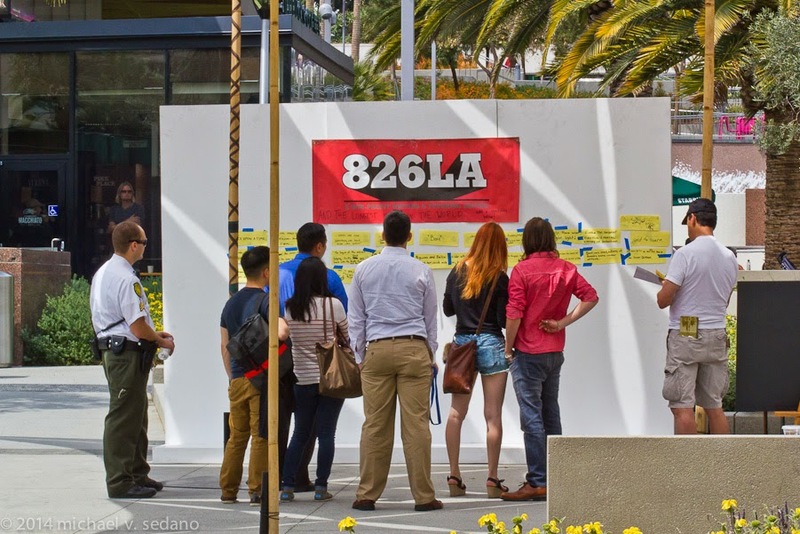 Saturday, I spot Doyle working 826LA’s display, urging passersby to contribute to the world’s longest story. Write, post, join in. It’s the best kind of yellow journalism from the grass roots. Red Hen Press has another prime spot, a pair of eight foot tables at a main intersection. 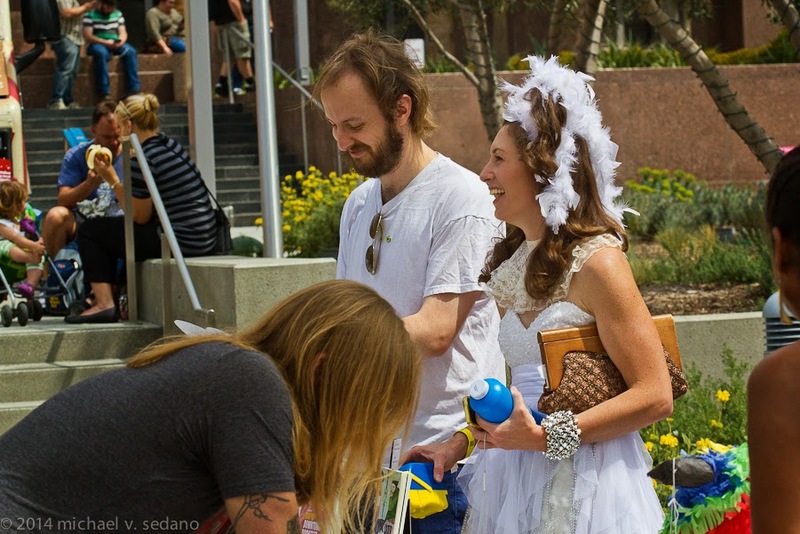 Billy Goldstein answers questions while author Nicelle Davis dresses like a cloud as a marketing gimmick for her book, Becoming Judas. 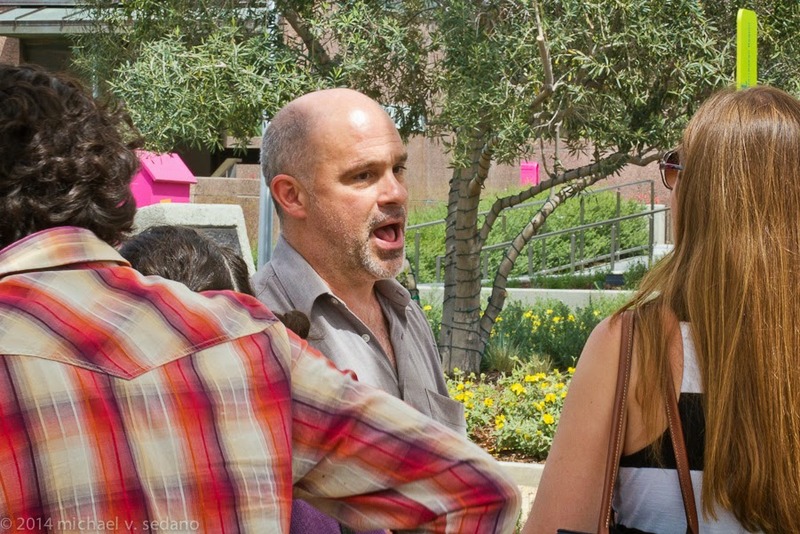 The Shakespeare Center Los Angeles tent occupies the corner diagonally from Red Hen. 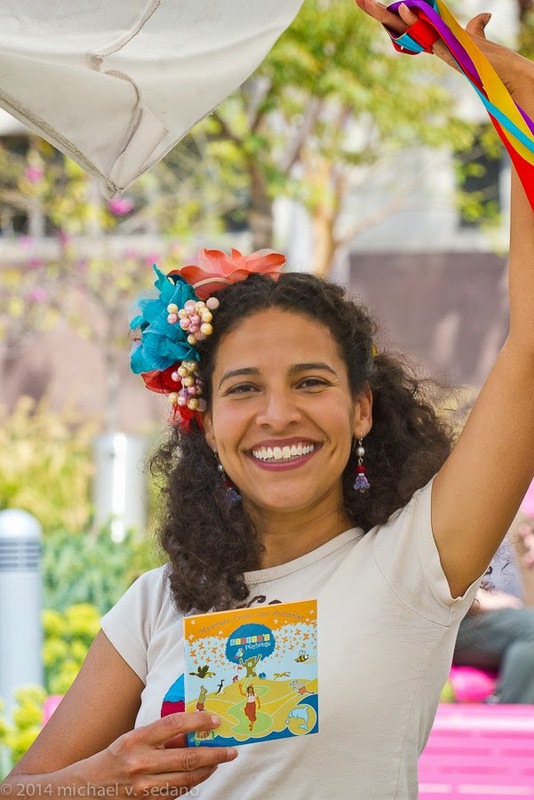 Marina Oliva explains her mission includes producing full-length plays. Assisted today by Giovanni and Noemi, they were giving away editions of Richard II. Marina explains the play is not on the bill this summer, Romeo and Juliet and Midsummer Night’s Dream are ideas. Shakespeare Center supports Veterans and proposes an interesting drama program for returning Veterans here. 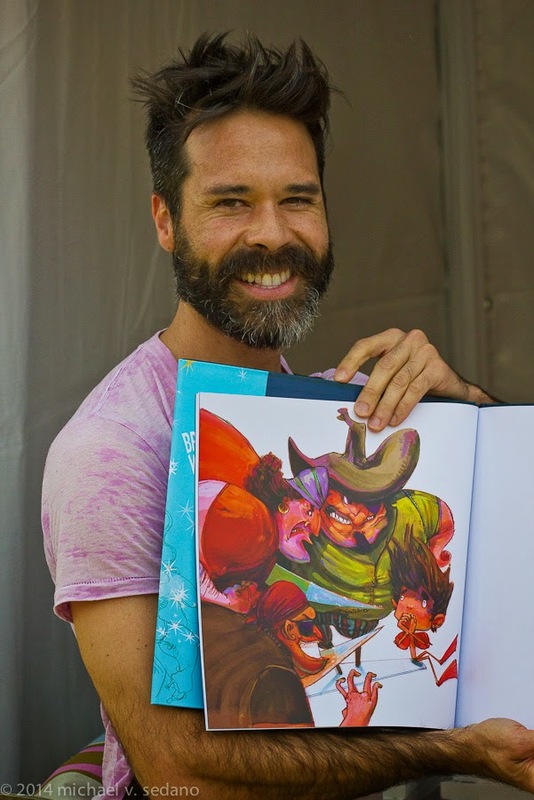 Ceballos introduces me to Victor Robert, whose wordless book encourages a kid’s storytelling unconstrained by what words the author might put on the page, or a writer’s frustration at all the words not used instead. You can learn more about the book, Brian Wonders, at the author’s website here. 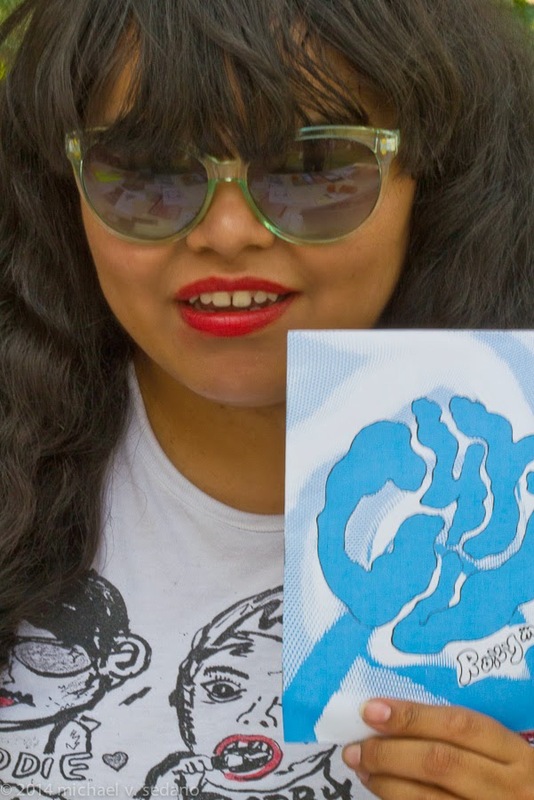 I introduce myself to Roxy Morataya, who occupies a table at the ‘Zines tent. I used to think ‘Zines an internet phenomenon that got supplanted by the blog. It’s a treat seeing contemporary ‘Zines. Exhibitors have covered two eight foot tables with ‘Zines. A 3-skein clothesline sways and frees some exemplars to a whirling wind that catches printed documents in a climatologic metaphor for literary ephemera. 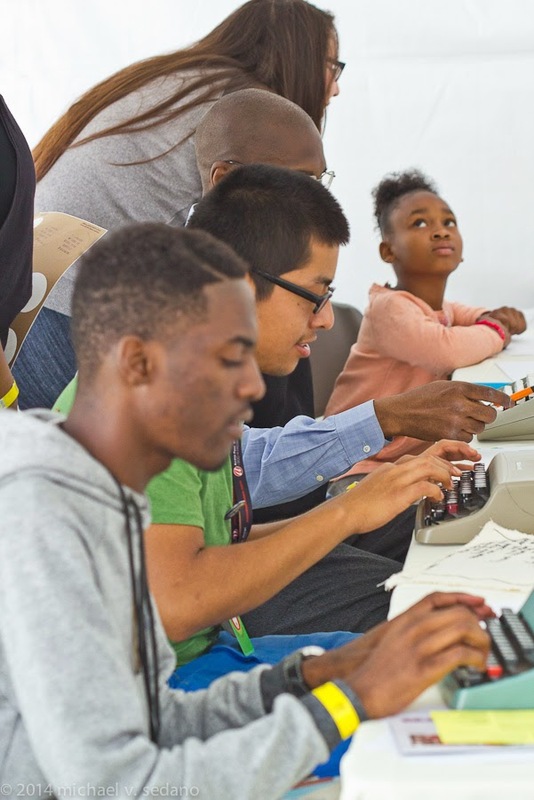 ‘Zines, like other literary ephemera, come in various forms, from multi-page saddle-stitch chapbooks to documents committed to a single sheet. Roxy traded me two quarters for an accordion-folded eight page handmade book she makes from a single sheet of typing paper. Entertainment for the familia means kids’ entertainment. My eye is attracted by the plastic shakers I spy with my little eye on a table near the stage where Story Pirates keeps kids engaged and attentive. Sadly, I’ve missed Birdie’s performance, the ebullient woman at the table tells me. On video, I catch up with Birdie’s Playhouse on Birdie’s website. 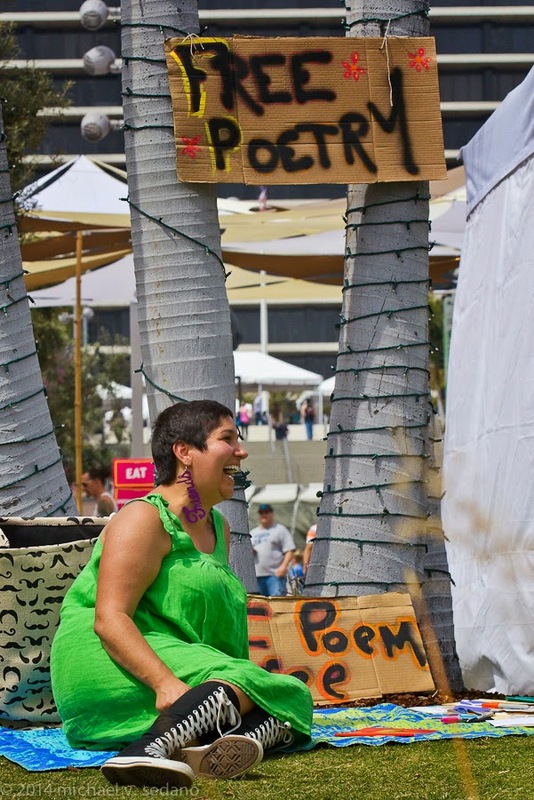 I catch up with the free poetry signs along the grassy knoll overlooking the stage, and the picnic lawn sloping down to the stage esplanade. Poets to the left of me, poets to the right. 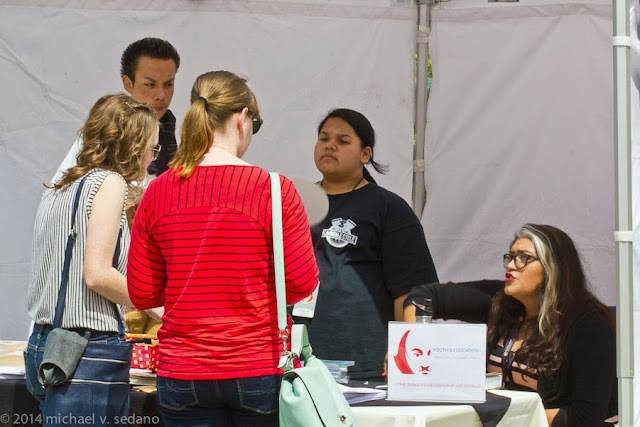 I see Karineh Madhessian emcee of La Palabra Reading Series, and Victor Avila, a regular On-line Floricanto contributor, greeting visitors. 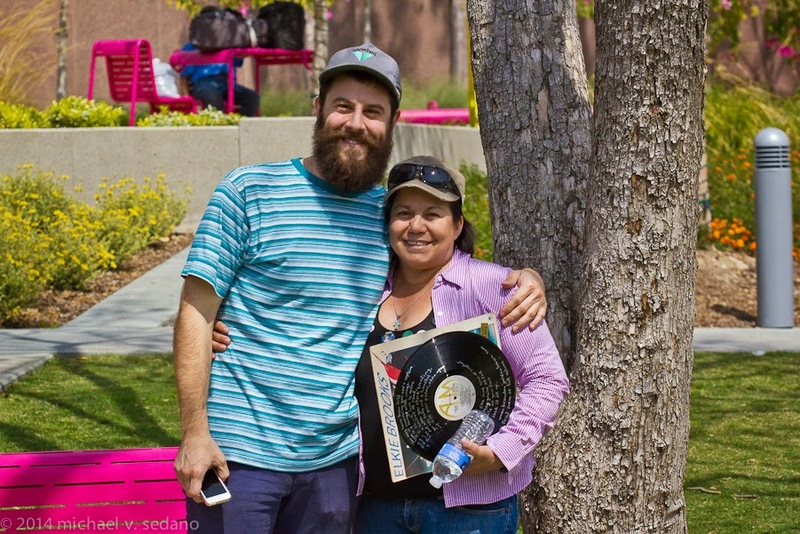 I spot Brandon Brown and a beaming Lucy Delgado with her poem on a vinyl album. 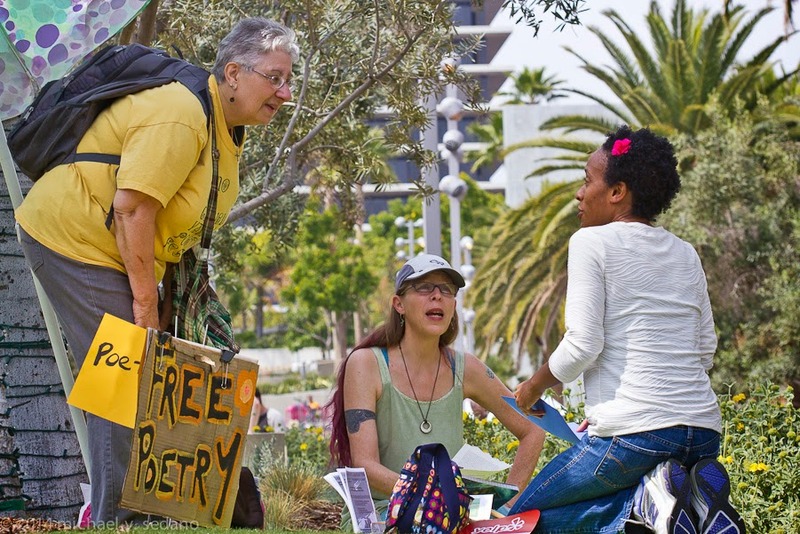 Visitors are delighted to talk to real poets and take in the sight of so many in one place. Poets create on typewriters, with Sharpie pen on vinyl 33 1/3 rpm records, stuff handwritten cards in rubber gloves, find poetry on random pages of pulp novel, send along a linocut postcard with a poem. 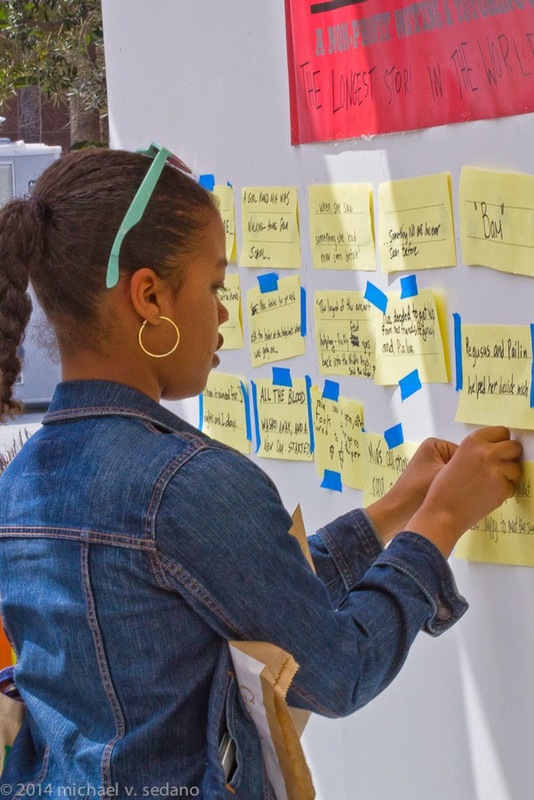 Dane F. Baylis chooses flip chart paper and chalk crayon that needs a spritz of fixative before the poet scrolls the poem for visitors like the delighted Sofia. Grand Park Downtown Bookfest makes a friendly warm-up for the upcoming gargantuan LA Times book festival that sprawls across the nearby USC campus. The only dour note are the white-shirted County cops. All whom I ask if they’d like a poem erect a wall of hostility. An LAPD cop is an exception, laughing with me that maybe later. Other than those sour deputies, this year’s Writ Large Press and Jessica Ceballos and crew do everything possible to have a completely enjoyable show. 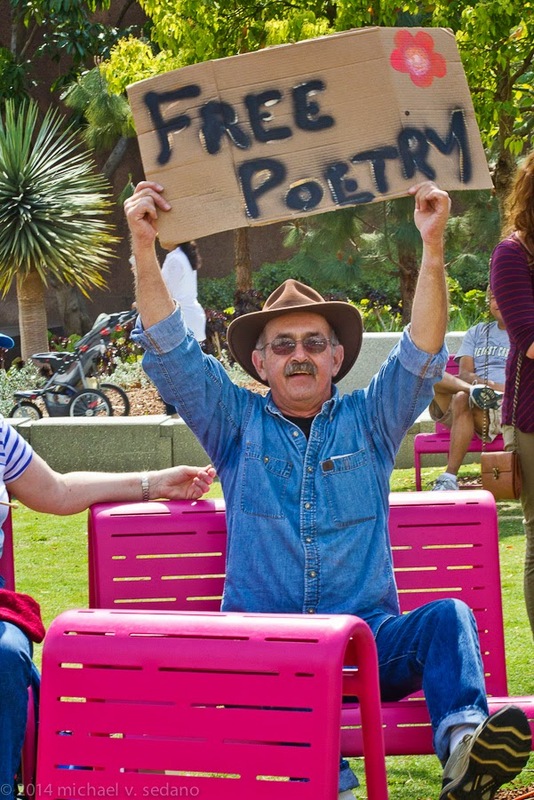 As word of mouth spreads, I foresee visitors to next year’s Grand Park Downtown Bookfest looking forward to another comfortable and free-spirited afternoon with books and poetry. Print continues to challenge the marketing efforts of anyone with the ganas to launch a print product. Art! The Magazine this month reaches a milestone fourth issue. Printed on coated paper in rich colors, the visual quality alone of Art! The Magazine makes every issue a collector's item. Text content adds richness to the already dazzling graphics and layout. 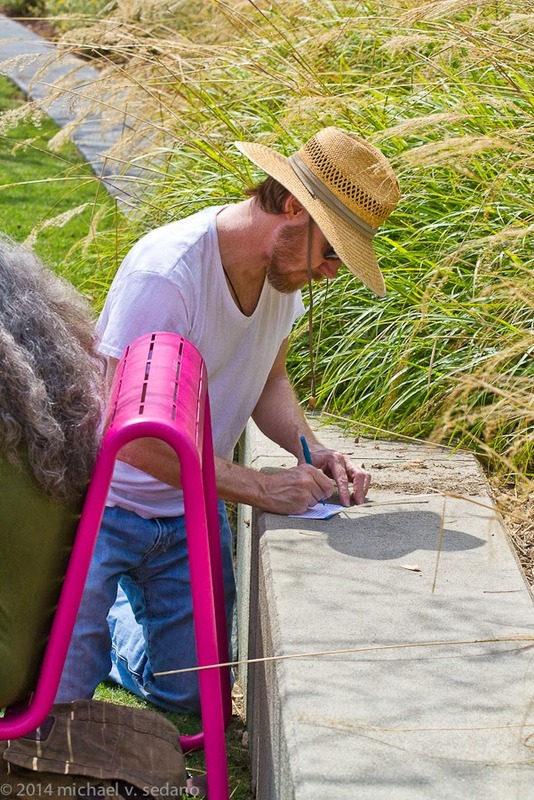 The current issue's story on muralist David Botello comes with luxurious close-ups. 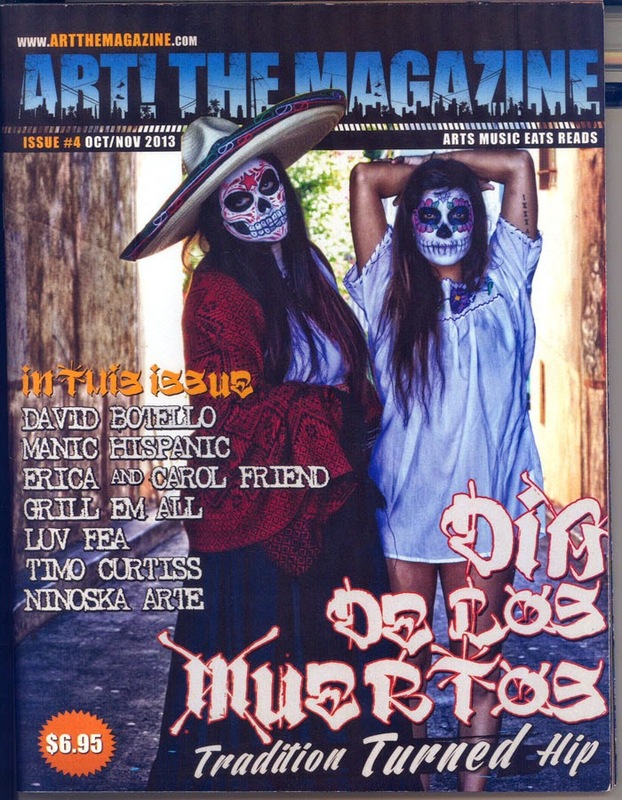 The cover story on how gente are updating the calavera look is a timeless addition to DDLM lore. Underpriced at $6.95, the magazine has yet to hit its advertising stride. That makes each issue content-rich, but limits the ability of the publisher to reach for ever more ambitious editorial content and more pages. Click here for availability and access. A successful commercial print publication needs a fifty percent ad hole to begin to meet publisher needs and goals. Getting there offers immense challenges to any print publication. Brooklyn & Boyle's current edition comes with a satisfying ad volume. That's encouraging to anyone who roots for community media. 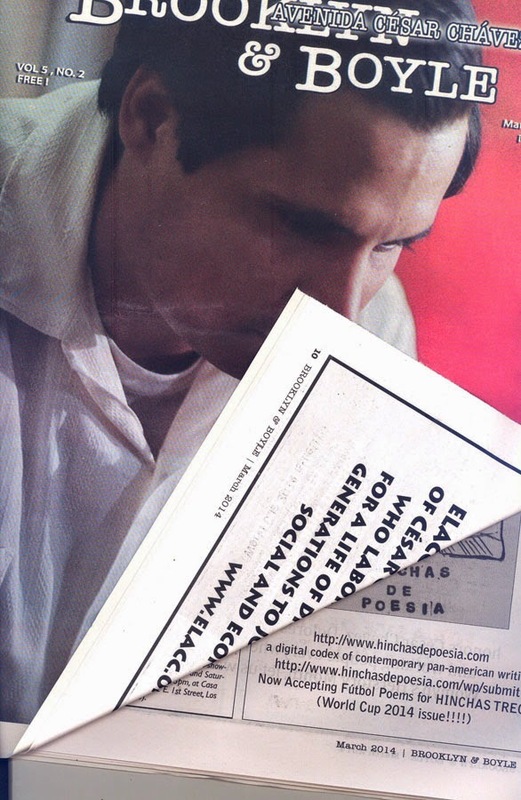 With continued ad expansion, Editor-Publisher and La Bloga friend Abel Salas may have built the momentum with advertisers to expand Brooklyn & Boyle circulation and coverage. It's already a highly admired community resource with a high pass-along endorsement. People talk about what they read in Brooklyn & Boyle. Other weeklies still hold the lion's share of SoCal advertiser dollars, but they're missing the boat. Like Art! The Magazine, Brooklyn & Boyle's readers tend to be community opinion leaders. Advertisers and marketers wisely value word of mouth because a friend's recommendation is among the more powerful motivators. Word of mouth begins with opinion leaders, Brooklyn & Boyle readers. For gente outside Brooklyn & Boyle's circulation area, the website doesn't hide behind a paywall. Click here to visit. & clean, fresh, crisp air. songs of Warblers & Western Bluebirds. watching over the flight of Falcons and Condors. and restful pools like the knowing enlightened minds. that is in fact a Grand Canyon. shockingly monumental red towers & mountains. at the inconceivable, shocking beauty. than the wisdom of this petrified forest. Slowly decomposing before our eyes. to let the true light in. Foghorn blowing in your face. “We don't want weeds in our bed! … Move along, move along!” they said. Because de-evolution is not the solution. Towering sculptures of time, history, and life. In this grand canyon state. Sus hijos y sus viudas! 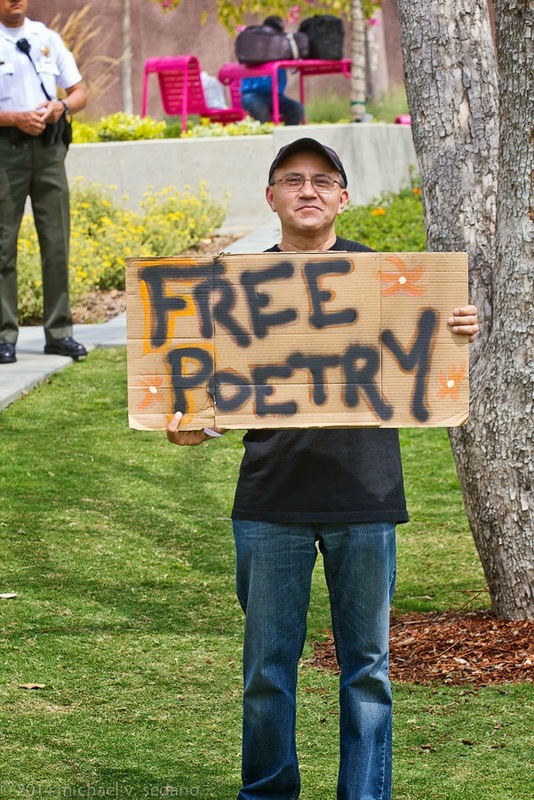 Paul Aponte is a Chicano poet born in SanJo, Califaztlan, and now a proud citizen of Sacramento. He lived in Tucson, Arizona for 9 years where his two kids and his appreciation of the desert and its native people were born . 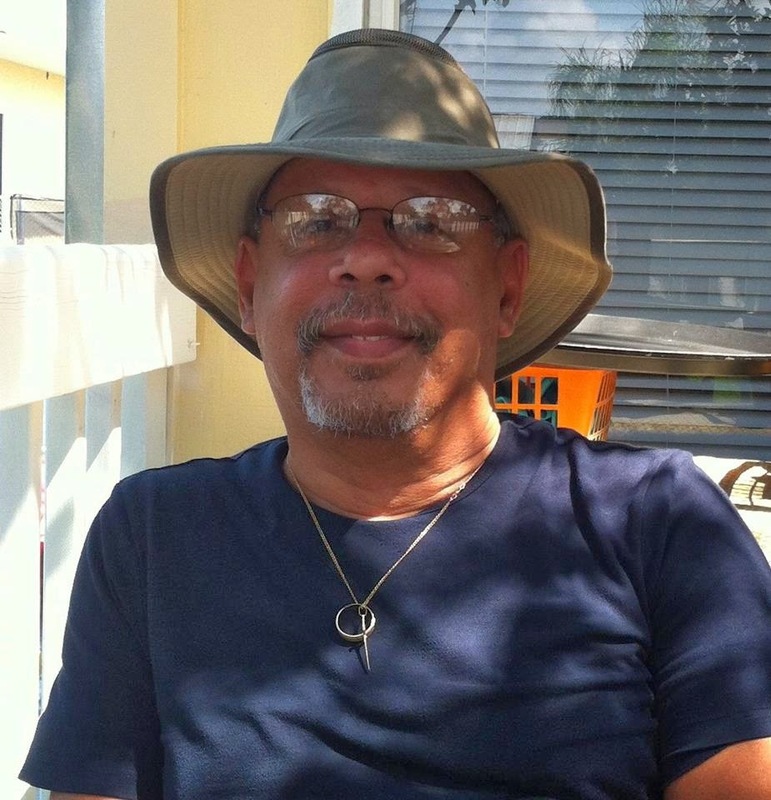 Paul, a member of "Escritores del Nuevo Sol", writes poetry in Spanish, English, and Spanglish, and enjoys breaking writing rules to communicate a truth in expression that can be seen in his writings. 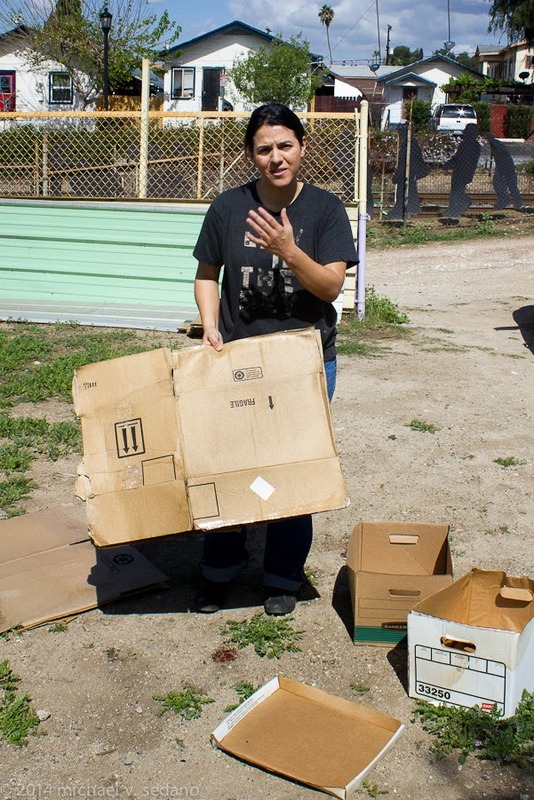 family, people, community, social awareness, and most importantly her love of earth. Betty Sánchez. Madre orgullosa de siete hijos y cinco hermosos nietos. 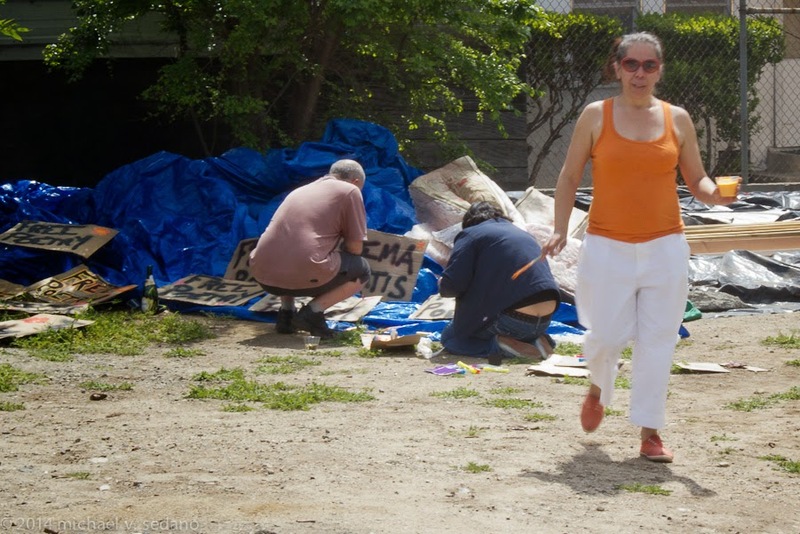 En la actualidad resido en el condado de Sutter en el cual trabajo como Directora de centro del programa Migrante de Head Start. Soy miembro activo del grupo literario, Escritores del Nuevo Sol desde Marzo del 2004. Contribuí en la antología poética Voces del Nuevo Sol y participé en el Festival Flor y Canto. 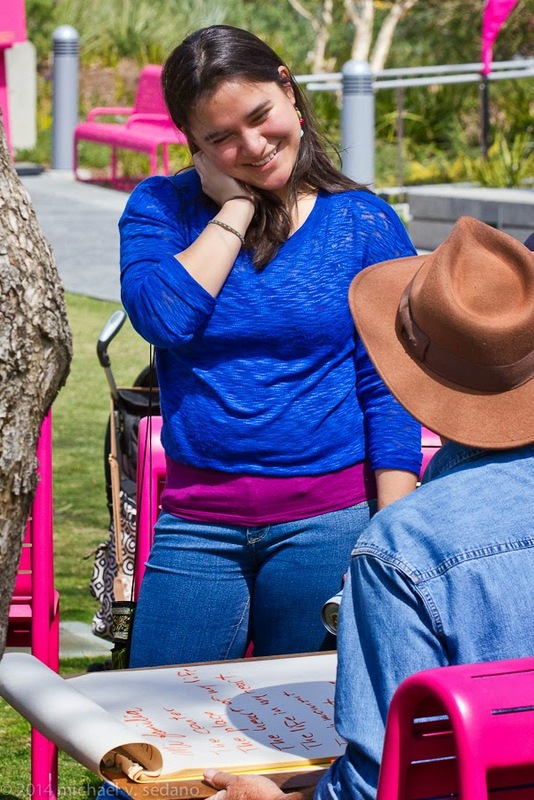 Ser finalista en el primer concurso de poesía en español organizado por el Colectivo Verso Activo, me dio la oportunidad de dar a conocer más ampliamente mi pasión por la poesía y por extensión ser invitada a colaborar en eventos como Noche de Voces Xicanas, Honrando a Facundo Cabral, y Poesía Revuelta. Es un privilegio contribuir en la página Poetas Respondiendo al SB 1070 y por supuesto en La Bloga. 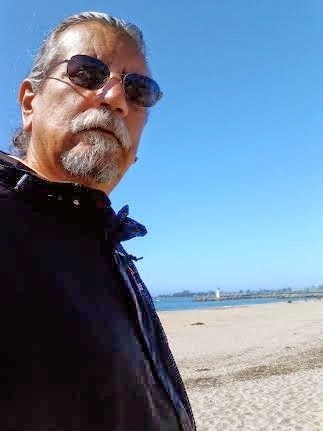 Joe Navarro is a teacher, creative writer, poet, a husband, father and grandfather, and has been an advocate for social justice and social change in labor, community, immigration, anti-U.S. intervention, education, anti-war and human rights issues. Ramon Piñero. "Ex Bay Area poet living in the buckle of the Bible Belt, aka Florida. Where good little boys and girls grow up to be republicans who vote against their own interest. Father of three and Grandfather to six of the coolest kids ever.